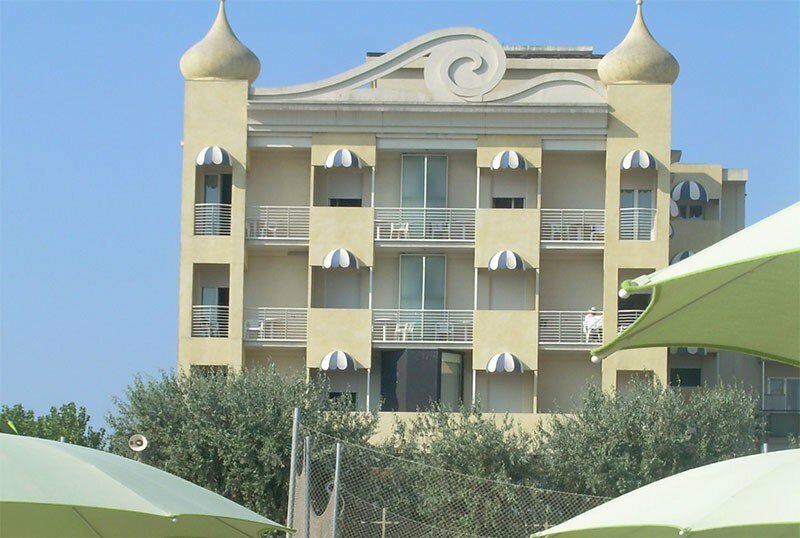 Three stars on the seafront in Viserba, the AmbientHotels Panoramic is a rich and well-appointed hotel. It is ideal for both families and business travelers. It has a sun terrace with hydromassage, parking, WI-FI, services for children and cyclists. Admits animals of small and medium size. The hotel overlooks the seafront of Viserba: the sea can be reached simply by crossing the road. Viserba is a small and quiet village in the north of Rimini, from which you can reach both the Italia in Miniatura park and Rimini Fiera and the Palacongressi in just a few minutes. There are three types of rooms among which you can choose, all comfortable and welcoming. Connecting rooms are available on request. PERLA TECH: recently refurbished, they are distinguished by design furnishings, modern services and breadth, characteristics that make them ideal for families and business travelers alike. They have TV 22 "with foreign channels, independent climate control, WI-FI, private parking, furnished balcony, possibility of breakfast on the terrace, beach towels available, minibar, radio with CD player, safe, telephone, bathroom with shower or bathtub, hairdryer, bathrobe.On request it is possible to have: bathtub, baby service, TV in the bathroom and sea view. PEARL CLASSIC: furnished in classic style, they are spacious and ideal for families. They have the same amenities as the Perla Tech room, without a bathtub but with free daily newspaper and breakfast in the room. CORALLO: these are the most informal rooms, with color TV, autonomous climate control, free WI-FI, beach towels available, balcony and sea view on request, baby service, telephone, safe, bathroom with shower on the ground without dish , courtesy set and hairdryer. Open-air porch, panoramic sun terrace on the 5th floor with Jacuzzi for 10-15 people, deckchairs and sun loungers, free bicycles, lobby with suspended terrace, 24-hour lounge bar, reading room, lift, beach towel available, welcome drink, theme nights. On request, external laundry service, free shuttle service to the airport and station. The hotel is equipped for cyclists. PARKING: uncovered free; garage on request and for a fee. CONVENTIONS: beach, parks, gym, swimming pool, waterslide, organized excursions, shuttle on request. SERVICES FOR DISABLED: entrance with elevator platform and room located on the ground floor. LUNCH AND DINNER: Romagna and vegetarian cuisine. Lunch is buffet style, à la carte dinner, 3-choice menu, homemade pasta and desserts, appetizers and side dishes of your choice, dessert trolley to round off your meals. The restaurant "La tavernetta sul mare" allows those who want to have lunch at the beach to choose between pizza, meat and fish. VARIATIONS: dishes for celiacs on request. In the hotel: baby / mini / junior club, entertainment, strollers, evening shows, bicycles with child seats. On request: baby sitter and pediatric counseling. In the room: crib, changing table, bottle warmer, baby control, sterilizer, toilet reducer, tub, potty. At meals: a restaurant reserved for families, high chairs, bottle warmers, place mats, cutlery and colored glasses, colored pencils, children's menu, baby food and vegetable soups, possibility of early meals, baby sitter and baby club available at meals, snack . On the beach: children's pool, entertainment and playground area. The hotel has a room for business meetings with technology, staff available and where you can complete meetings with coffee breaks and business lunches. It offers a free shuttle service to Rimini Fiera, the Palacongressi, the station and the airport. It makes available to those who travel for work: WI-FI in the room and in common areas, internet point, multilingual info point, private parking and favorite newspaper in the morning. On the 5th floor of the building there is a panoramic sun terrace equipped with a large Jacuzzi (10-15 seats), deck chairs and sun loungers. 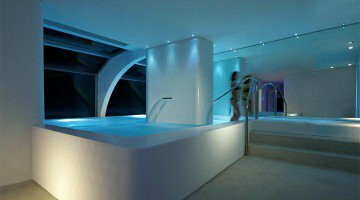 The hotel collaborates with the i-FEEL GOOD spa of the I-suite (hotel located on the seafront of Rimini) where guests can access the heated swimming pool, the sauna and numerous beauty treatments and massages at special prices. In addition, the AmbientHotel Panoramic has an agreement with the Mantra Fitness Club, 300 m away, where guests can access the gym for free until late evening. There is also a wellness area with sauna, relaxation area and wellness treatments at discounted prices. Many services dedicated to cyclists: bicycle storage, rental of racing and mountain bike, garage for your vehicle, repair shop, excursions with expert guides and tailor-made itineraries. The hotel has an agreement with the Bagno n. 20. Or the special ALL INCLUSIVE offer is available: 1 umbrella + 2 free beds at the beach and drinks included at the restaurant during meals. You can also add beach service to the offer, drinks included in the restaurant or full board! From € 476 total per person.